A Fragility Fracture is any fracture that follows a low impact injury, typically, a fall from a standing height or less. In healthy people, such falls should not cause any bone fractures. If this happens, irrespective caused the fall, one should wonder what made the bones fragile. Ideally, one should know of weak bones with proper screening and act accordingly. Yet, many preventable fractures happen without prior knowledge of underlying weak bones, and many of those are treated without paying attention to the underlying bone weakness. The first fracture is a warning sign, and a very important one! One broken bone is plenty, and all effort should me made to prevent a future, and potentially more serious, fracture. The most common cause of fragility fractures is osteoporosis. 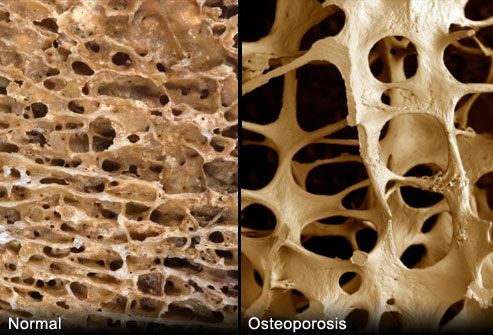 Osteoporosis literally means hole-filled bones. It refers to the fact that the bone is structurally weak and spongy, that is, porous. This makes the bone of low mass, fragile and likely to break. The most commonly affected areas are the hip, spine and wrist. A lesser and earlier degree of bone mass loss is called osteopenia. It means weak bones. Osteopenia can progress to osteoporosis if not addressed early on. About 52 million Americans have osteoporosis or osteopenia. Of those, two million break a bone each year. This number is expected to double by 2040. Osteoporosis has no signs or symptoms until a fracture occurs – this is why it is considered a “silent disease.” A lot of patients don’t know about it until they break a bone. Even then, the break is often blamed on weather or age. If you’ve had a previous fragility fracture, you are twice as likely to suffer a fracture in the future. As many as 1 in 10 of patients experience a second hip fracture within a 3-4 years. Over 2 million fragility fractures occur each year – more than heart attacks, stokes, and breast cancer combined. This number is on the rise and expected to double by 2040. While a wrist fracture may not have the most severe impact on life, a spine fracture, or a hip fracture, may end the patient up in a nursing home for life. There is also 25% increased risk for mortality following a hip fracture. Preventing an initial or subsequent fragility fracture reduces the suffering and prevent rapid the associated negative impacts on life. The first step to prevent fragility fracture is awareness. Is this fall bad enough to break a bone, or is my bone weak enough to break with such a low-impact fall? There are a lot of simple things that can be done to prevent such injuries. Optimize homes for fall prevention by minimizing clutter and removing obstacles, such as books , wires, or toys of the ground. Install safety rails in the bathroom and use nightlight. Make sure that area rugs are anchored to the floor and remove throw rugs. Wear slip-resistant shoes. Optimize vision and get regular eye checkups. Use glasses as prescribed. Make sure there is enough light indoors. Be aware of the environment. Do you expect ice outside home? Is it going to be slippery on the porch? Do you live on hill with a dirt road? Take a fall prevention class. Join an exercise class that focuses on balance such as Tai Chi. Exercise daily! Even modest increases in weight-bearing helps. Walking, dancing, and hiking, can make bones stronger . Physical Therapy can help with strength and balance. Assistive devices also help decrease balance-related risk of falling. Review your medications with your regular doctor to make sure they are not making you drowsy or lose focus and balance. Diet is of paramount importance: calcium, vitamin D, and protein. A healthy diet, supported by doctor recommended supplements can go a long way. The commonly accepted amount is 800-1,000 units of vitamin D per day and 1,000-1,500 mg of calcium per day. Avoid excess alcohol consumption as it can lead to bone loss and increases risk of falling. Be a nonsmoker! Tobacco is toxic to bones health and delays or even interrupt fracture healing. Get an osteoporosis test. A bone mineral density test (DEXA) can detect osteoporosis. The test takes less than 15 minutes. Patients who tested positive for osteoporosis will benefit from medications. The key point is to be tested. Women should have a bone mineral density test performed at the time of menopause. Elderly men and women, especially with a prior fragility fracture should be tested as well. Osteoporosis medicine can decrease fracture risk by 40-60%. Unfortunately, only 20% of patients of those who could benefit are actually receiving proper treatment and prevention measures.